In need of a new job? 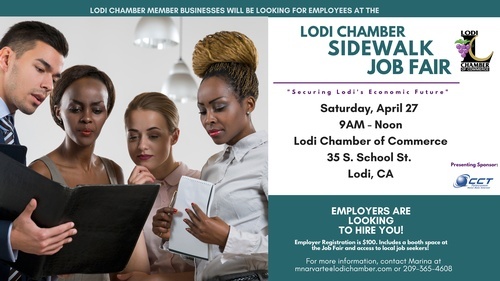 Join us on Saturday, April 27 from 9AM - Noon for the Lodi Chamber Sidewalk Job Fair. Bring copies of your resumes and dress to impress. Thank you to CCT Telecomm for sponsoring this event! If your business is looking to hire- please email Marina Narvarte at MNarvarte@LodiChamber.com about available booth space in front of the Chamber.